As the National Sea Grant College Program celebrates its 50th anniversary, we take a look back at how our program has supported education through graduate fellowships. The Sea Grant Knauss Fellowship provides a unique educational and professional experience to graduate students who have an interest in ocean, coastal and Great Lakes resources and in the national policy decisions affecting those resources. The fellowship, named after one of Sea Grant's founders and former NOAA Administrator, John A. Knauss, matches highly qualified graduate students with "hosts" in the legislative and executive branch of government located in the Washington, D.C. area, for a one year paid fellowship. In the same vein, the California Sea Grant State Fellowship provides the opportunity for graduate students and recent graduates with the opportunity to acquire "on the job" experience in the planning and implementation of marine and/or coastal resource policies and programs in the state of California. Modeled after the Knauss Marine Policy Fellowship Program, the program matches graduate students and recent graduates with "hosts" in State or Federal agencies in California for a 12-month paid fellowship. In month-long this series, we explore what former California Sea Grant State Fellows have been up to since their fellowship. 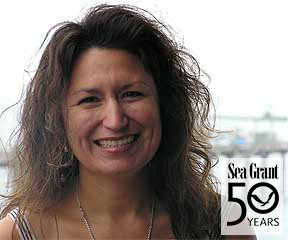 Y. Meriah Arias-Thode earned a doctorate degree in marine biology from Scripps Institution of Oceanography in 2002. Her dissertation examined the ability of certain bacteria in ocean sediments to detoxify the heavy metal chromium. In 2002, California Sea Grant awarded her a California Sea Grant State Fellowship at the California Environmental Protection Agency in Sacramento. As a State Fellow, Arias-Thode helped craft a multi-agency strategic plan for managing watersheds in the state. Largely on her own initiative, she also found opportunities to stoke a dormant passion – working with under-served people in Baja California, Mexico. During her year in Sacramento, she co-wrote and taught a course on hazardous waste to first responders, lab technicians and resource managers in the border cities of Mexicali and Tijuana and launched a "hands across the border" program in which American expertise in treating wastewater and distributing potable water was shared with colleagues in Mexico. "I always wanted to work with border issues but never knew how," said Arias-Thode, a Mexican American who grew up in southern Texas and is fluent in Spanish. Having the chance to work on real-world cross-border projects solidified her decision to leave academic science to pursue a career path that combines her philanthropic instinct, language and science skills. After her fellowship, Arias-Thode became a Baja California Environmental Careers Organization Fellow at the International Community Foundation, a San Diego-based non-profit that distributes charitable donations to communities throughout the Americas and Asia. During her fellowship, she learned how to identify areas of high conservation priority on the Baja California coast. Identifying these areas has become urgently important because of Mexico's recent decision to approve the construction of a network of marinas, "a nautical stairway," to woo American tourist dollars to the region. The information she gathered was turned into a set of recommendations for donors interested in supporting marine conservation on the peninsula. "The state fellowship changed my career path because I really wanted to use my Spanish and my science, " Arias-Thode said. "To combine them is fantastic." Her advice to prospective fellows: "If you are a person interested in working in science but not in academia, and you are interested in policy or how policies are made, you should definitely apply. It was a fantastic opportunity for me." Arias-Thode is currently a senior environmental microbiologist and scientist at SSC Pacific where she completes microbial fuel cell research.